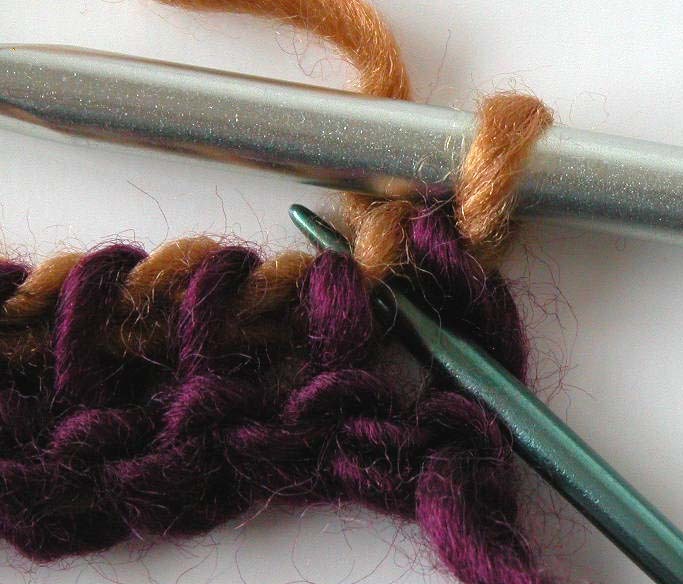 Double-Hook Crochet: Guest Post, by Darla Fanton! Hi, I’m guest blogger Darla Fanton. I had the pleasure of meeting Vickie in my Double Hook Crochet Basics class at the Summer 2011 Knit and Crochet Show. When she asked if I would be willing to share some information about Double Hook Crochet with her readers I was happy to agree. 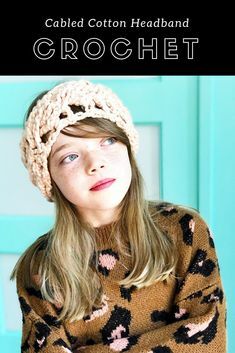 I love all styles of crochet, but must admit that the “sister techniques” of Tunisan and Double Hook Crochet hold a special place in my heart. Like most sisters they share some of the same characteristics but also have differences. They both use long hooks to pick up and hold loops for part of the work. The next step has you work off those loops until just one loop remains and the process begins again. Tunisian hooks have a knob or stopper on one end of the hook and the same side of the work is always facing you. Double Hooks literally have a hook on each end as you will be turning your work and alternating which end of the hook you are working with. Using two contrasting colors of yarn results in a finished project where Color A predominates on one side while Color B is predominate on the flip side. Combining 2 balls of Sheep(ish) yarn with one double-ended hook can result in a soft, warm scarf with a fun look in nearly no time at all. My scarf is about 4 1/2” wide. 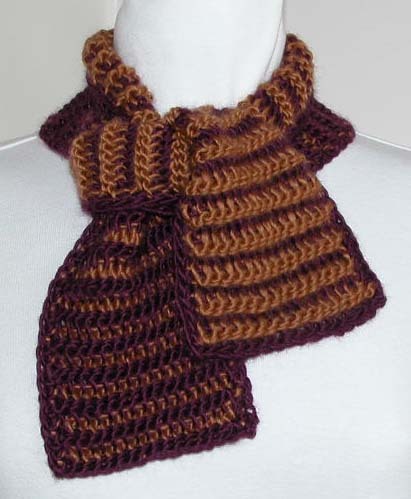 If you would like a wider scarf, simply work additional chains to begin. Row 1: With A, ch 17; insert hook in 2nd ch from the hook, yarn over and draw through keeping loop on hook; *insert hook in next ch, yarn over and draw through keeping loop on hook; rep from * across. – 17 loops on hook -insert Photo 1- Note the location of the yarn tails in each of the photos to better understand the process. rep from * across until 1 loop of Color B remains on hook. Looking at your work you will see vertical bars of Color A with what looks like a horizontal chain of Color B stitches running between them. 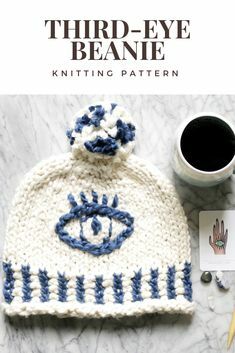 For this project we are going to be working into those horizontal stitches. draw through first loop of B; *yarn over, draw through 2 loops (one A, one B); rep from * across until 1 loop of Color A remains on hook. Looking at your work at this point you will see vertical bars of Color B, with a horizontal chain of Color A stitches running between them. Row 6: Slide loops to opposite end of hook and turn hook 180 degrees. With B, yarn over, draw through first loop of A; *yarn over, draw through 2 loops (one B, one A); rep from * across until 1 loop of Color B remains on hook. Repeat Rows 3-6 until scarf is desired length after a Row 4. 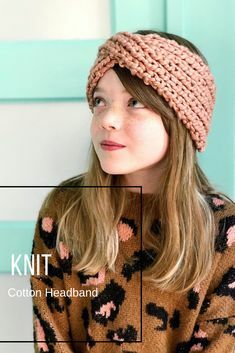 In other words, the point where you have one loop of A on the hook Bind-off: With A, slip stitch under the top strand of each horizontal stitch, transfer final loop to standard crochet hook. Edging: With A and standard hook sc evenly along each long edge. Fasten off and weave in all yarn ends. filed under Books/How2 Goodness, Knitting/Crochet, Stitch.Rock.Love Sheep(ish). Lovely scarf! The yarn is fabulous. I have always wanted to take the time to learn double hook crochet because it has the look and feel of knitting!